Click Through Rates, in short called as CTR. It is a significant factor while maintaining Pay Per Click ads. Click through rate is important for an accounts because it directly hits the hits the score of earning through clicks and maintains quality. Most of the people working with Pay Per Click ads must be dying to know “How to increase your CTR in your pay per click ads”. Don’t worry if you are being paid a little from you pay per click ads. Here are some killers tricks to boost your CTR and earn earn a huge amount from your Pay Per Click Ads. In the continuation of this article we’ll guide you How to increase Your CTR in your pay per click ads. Read on…. How To Increase Your CTR in your Pay Per Click Ads ? There are many factors that effect CTR on an Ad. It includes Keyword selection, Ad placement, CPC, Ad designing, Keyword focussing And many more. It is always considered to choose a keyword with high CPC and low competition. For instance, if you are selling Apple products and if you consider Apple as targeted keyword, it don’t even pays pea nuts. So, always choose a keyword with low competition. Moreover, the Ad placement is an important factor to increase CTR. The Ad banner must be attractive and the color of the Ad must reflect to the eye of the visitor. You know? Designing Attractive Ads drives visitors towards the Ads. Keyword matters in every aspect of the site. A keyword with high CPC pays good when the visitor clicks on ad entering through that keyword. Adding relevant search keyword is an important factor to drive traffic and using attractive ads draws the visitors towards it. Make sure that the keyword chosen and the advertisement are relevant to each other. If the targeted keyword doesn’t matches the Advertisement, it makes the visitor quit the page. Neglect competitive keywords and opt to those which describes your Ad in ease. Targeting keywords with high competition also pays, but we may get too little clicks with high CTR. But, high competition is a risky task for a newly started site. The most important factor is getting traffic. Without getting visitors How can an Ad get clicked? So, traffic matters everywhere. Search engine optimization and keyword optimization drives huge traffic to the site. Try to divert the traffic from every page to the Ad you are targeting and it may increase your CTR. But, it is a difficult task to drive visitor from on page of the site to the other in the same site. So, place links of your pages in between the articles and build a web of links in your site. Don’t prefer paid traffic because, most of the service providers sue bots to drive traffic to your site. Clicks by bots are of totally use less and pays nothing to you. Making these attempts may even destroy you CTR rate completely rather than improving. Adding TradeMark or registered symbol makes your Ad look professional. It makes the visitor to trust the Ad service provider. Trust is more important to drive loyal visitors. Moreover, if you add TradeMark symbol, no other companies will try to compete or Advertise your product. It act an important aspect to decrease the competition and drive huge traffic. It is the most significant on in this guide ”how to increase your CTR in your pay per click ads”. The placement of Ads is an important aspect in this guide “How To Increase Your CTR in your Pay Per Click Ads”. The Ad selected and targeted must be bigger in size. Adding attractive colors and designs in the Ad makes the ad looks unofficial but it attracts some of the users and increase your click through rate. Repetition of the Ads increases your CTR with ease but, make sure that the site doesn’t look unattractive. Some of the visitors hates placing Ads between the content. So, take care that your site’s reputation should not get damaged. Do not repeat the same Ad in every page and post. It makes the visitor ignore as he/she might have seen it in your site in past. Quality score is an important aspect of the guide ”How To Increase Your CTR in your Pay Per Click Ads”. Getting huge number of clicks with low quality pays nothing. So, it is always considered to maintain the quality of the score. If your Ad does’n appear in the first page of Google, you may face the less traffic, less quality score and thus less click through rates as well. So, in case of Google Adsense it is very important to appear in the first page. But, coming to the case of Pay Per click services the matter is different. No matter where the traffic is from. The guide ”How To Increase Your CTR in your Pay Per Click Ads” provided you various tips to increase Click through rate of your pay per click ads. So, consider every step of the guide and you may find your Pay per click earnings reaching the sky. 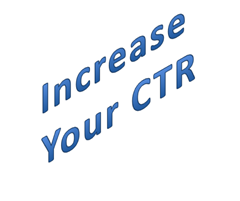 Share your comment 1 responseTO How To Increase Your CTR in your Pay Per Click Ads.